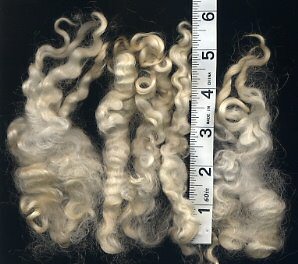 My Leicester Longwool is the last rare fleece I have to work on for my Rare Breed Sweater. The fleece was given to my by my friend Betty in North Carolina, a handspinner who has bred and raised sheep for a long time. It came from Alex, her Leicester Longwool wether, a very handsome fellow. When I first received the fleece, I fell in love with its luster and curls. The fleece had been heavily skirted and washed before I got it, so it is quite clean, except for a small anount of VM. It was still slightly greasy as well, retaining some of it's natural lanolin. There are no short bits or second cuts. The full length of the staples (pulling out the waves and curls) ranges from 6 - 10 inches. The crimps and spiraling curls measure 2 per inch. The fleece is very fine, soft, and silky to touch. I did a little research on the breed at the Oklahoma State University Breeds of Livestock website. I learned that it is also known as English Leicester and is a very old breed. It was developed it the 1700s from the Old Leicester breed. George Washington first imported them from the UK to the US. 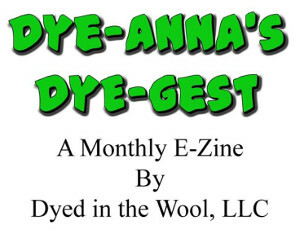 Fleeces generally weigh from 11 to 15 pounds and have a micron count of 32-38. For more information on the breed, visit the Leicester Longwool Sheep Breeders' Association. My plan is to remove the grease and comb it on my mini wool combs. My immediate goal is to spin enough of a sample for one sheep motif on my rare breed sweater. I reckon I'll decide how to use the rest of it after I'm spun some. Love the kinks and curls! It looks so luxurious and soft in the picture, I'll bet it will be wonderful spun up and knitted. That is a beautiful fleece, and one that I have not had the pleasure of seeing on or off the animal.